Present: Michael Kreitinger, Alan Church, Ryan Jilek, Jeremiah Thorpe, Dale Sattler, Rocky Stoltz and Jon Stika. Discussed barrel beers. Shares of current barrel beer (Imperial Stout) will be distributed at a date to be determined near the end of January or beginning of February. Shares are as follows: Jeremiah Thorpe – 5 gal, Jerry Ford – 5 gal, Paul Ellerkamp – 5 gal, Alan – Church 10 gallons, Jon Stika – 5 gal, Rocky Stoltz – 10 gallons, Ryan Jilek – 15 gallons. It was decided that the club would absorb the estimated 5 gallon angel’s share evaporation loss that has occurred. Quantities of Brown Ale to refill the barrel need to be delivered to Custom Data on or before the January club meeting scheduled for January 24th 2013. Planned quantities of Brown Ale will be supplied by the following members: Paul Ellerkamp – 5 gal, Rocky Stoltz – 5 gal, Ryan Jilek – 10 gal, Jerry Ford 5 gal, Alan Church 10 gal, Jon Stika 5 gal, Jeremiah Thorpe 5 gal, Michael Kreitinger 5 gal and the club 10 gal. Jon’s share and the clubs’ share have been brewed and delivered to Custom Data to date. All other shares have been brewed or planned to be brewed soon. Rocky moved to maintain the price of club dues at $25/year. Seconded by Alan. Motion passed. Discussed group Brew Your Own (BYO) magazine subscription. The club needs at least 10 subscriptions or renewals to participate in the discount. Rocky moved to have the club provide a $4 discount on each BYO group subscription that is accompanied by payment of club dues ($25). Seconded by Michael. Motion passed. Contact Rocky Stoltz at rstoltz@ndsupernet.com regarding the BYO subscription group discount and payment of dues. Mention was made of upcoming elections for club officers at the January meeting. Vice President (currently Ryan Jilek), Treasurer (currently Rocky Stoltz) and Members at Large (currently Jerry Ford and Alan Church) terms expire in January 2013. Discussed possible locations for a club outing; including: Laughing Sun in Bismarck, Buffalo Commons in Mandan, or Beaver Creek in Wibaux, MT. 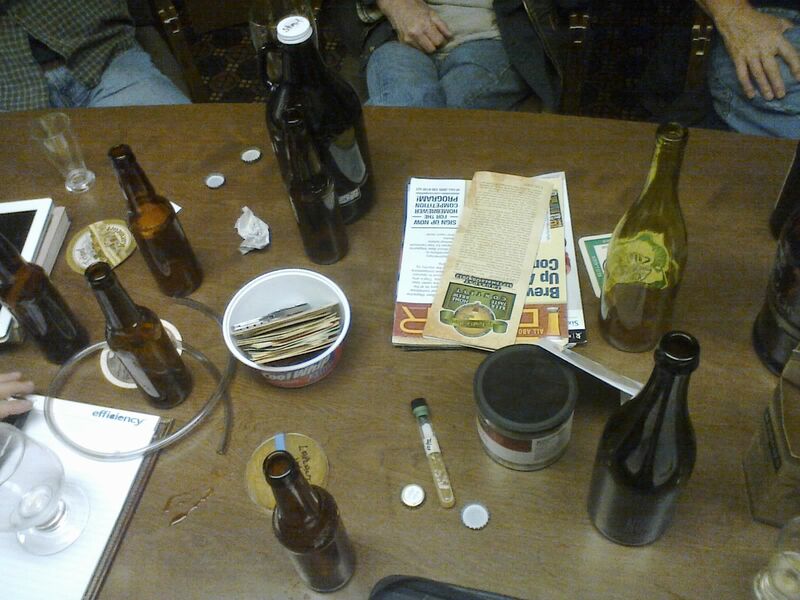 Empty bottles, yeast slant, tubing for sampling barrel beer… just another typical meeting of the Heart River Home Brewers. Present: Chip Ford, Rocky Stoltz, Jerry Ford, Dale Sattler, Alan Church, Ryan Jilek, Paul Ellerkamp, Jeremiah Thorpe and Jon Stika. Discussed the wild yeast (La Plante) captured by Alan and cultured by Ryan. Several good slants with what appear to be pure colonies have been produced by Ryan. Discussed ciders made this fall. Discussed and sampled current barrel beer (Imperial Stout). Discussed next barrel beer and settled on a Brown Ale. The club purchased two Hex Nut Brown Ale kits from MidWest Supplies that will be brewed by Jon to go into the barrel when the Imperial Stout is withdrawn from the barrel. The balance of the volume needed to fill the barrel will be brewed by: Paul (5 gallons), Rocky (5 gallons), Ryan (10 gallons), Jerry (5 gallons), Alan (10 gallons), Jeremiah (5 gallons), Michael Kreitinger (5 gallons) and Jon (5 gallons). It was decided that all beer brewed to fill the barrel will be delivered to Custom Data on or before the January meeting scheduled for January 24th, 2013. Rocky provided a Treasurer’s report showing a balance of $669.65. Jon reported on the recent Hoppy Halloween home brew competition in Fargo at which he judged, earning the necessary points to earn the rank of Certified beer judge. Chip brought an American Pale Ale which was judged by Jerry, Ryan and Jon with an average score of 38. Rocky brought Chokecherry Stout, Dale brought Gooseberry and Mint wine, Alan brought a Belgian smoked ale, Paul brought Harvest Dance Wheat wine and Old Numbskull Barley wine, Jeremiah brought a Scottish Ale and Jon brought Hard Cider. 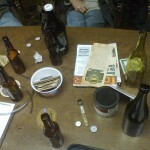 You are currently browsing the Heart River Homebrewers weblog archives for December, 2012.